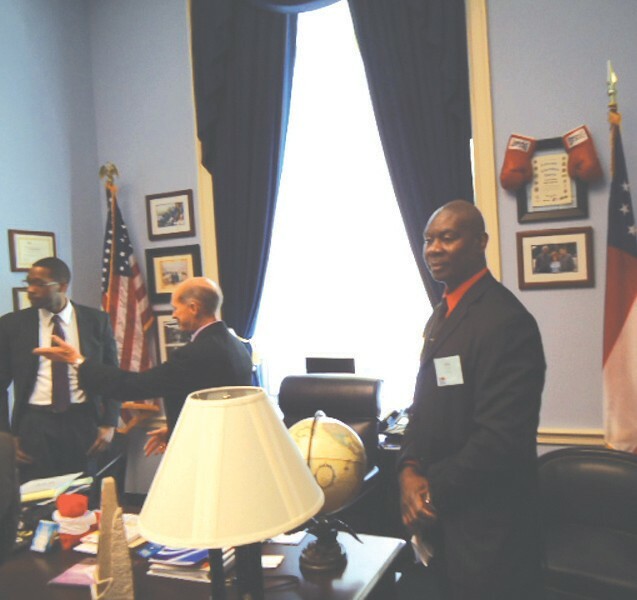 Willie Haynes, an Engineering teacher at Hubert Middle School, attended the Association for Career and Technical Education’s (ACTE) National Policy Seminar (NPS) March 4-6 in Arlington, VA, and met with members of Congress on Capitol Hill to educate them about the value of career and technical education (CTE). With CTE programs expanding and changing across the country to meet the needs of employers, students and communities, educators and administrators are challenged to effectively advocate for resources and support on local, state, and federal levels. Over 400 teachers and administrators attended the conference. The National Policy Seminar is an annual event that takes place in early spring as policymakers are beginning work on the federal budget and appropriations process. At the opening session of the NPS, attendees heard from Dr. Anthony Carnevale, director and research professor of the Georgetown University Center of Education and the Workforce, who spoke on his research findings in career outcomes for students engaging in CTE programs in secondary and postsecondary settings. Carnevale reported nearly 30 percent of associate degree holders make more than those with bachelor’s degrees, and 44 percent of graduates from four-year College have higher earnings that those with graduate degrees. Carnevale applauded the efforts of ACTE, noting that career tech programs were an efficient and proven approach allowing students to gain real-world experience that is supportive of the continued development of a skilled workforce. In addition to Woodville Tompkins, a full-time, dedicated technical and career high school, the Savannah Chatham Public School System’s Career, Technical, and Agricultural Education courses include Agriculture, Architecture, Construction, Communication & Transportation, Business & Computer Science, Culinary Arts, Education, Engineering & Technology, Family & Consumer Science, Government & Public Service, Healthcare Science, Marketing, Sales & Service.